In case you missed the original Finer Points articles where we discussed the Stack and State-Based Actions, you can check them out here and here. This week we're continuing the tradition of discussing wildly complicated rules minutia with Layers. When you're trying to figure out whether your Turn to Frog is the right play, you'll need a basic understanding of Layers to make that decision. The layers are in place to provide a basis for applying continuous effects in the correct order, such that you consistently end up with the same characteristics given a set of circumstances. First, let's look at an example of why we need layers. You control Castle, giving your untapped creatures +0/+2. You have a Llanowar Elves in play and untapped, which is enchanted with Dead Weight. 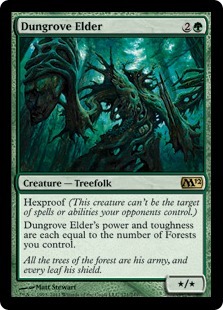 Your opponent casts Twisted Image on your Llanowar Elves. It's not entirely straightforward to determine what's going on. Layers help solve this problem by putting each type of effect in a category to be processed in a specified order. Of course, this is a relatively simple example, and infinitely more complex situations are bound to arise when you play enough games. Layer 1: Copy effects are applied. See rule 706, "Copying Objects." Layer 2: Control-changing effects are applied. Layer 3: Text-changing effects are applied. See rule 612, "Text-Changing Effects." Layer 4: Type-changing effects are applied. These include effects that change an object's card type, subtype, and/or supertype. Layer 5: Color-changing effects are applied. Layer 6: Ability-adding and ability-removing effects are applied. Layer 7: Power- and/or toughness-changing effects are applied. That's simple enough, right? Let's look at an example to nail down the first few layers, then we'll get to Layer 7, the tricksiest of layers. You control an Inkmoth Nexus which you have animated, making it a 1/1 Blinkmoth Artifact Creature Land with flying and infect. Then you cast Phyrexian Metamorph copying the animated Inkmoth. What do you have? You have an un-animated Inkmoth Nexus. Based on Rule 706, your copy only gets the copiable values of the object it is copying as written on the card (or as written on the spell or ability that created the object,) not the modified values. Now we get to the layers. Your Phyrexian Metamorph's ability is activated, turning it into a 1/1 Blinkmoth Artifact Creature Land with flying and infect. Since this ability applies in Layers 4, 6, and 7, we'll apply things in that order. The Blinkmoth subtype, as well as the Artifact Creature type comes from layer 4. In layer 6, we apply the infect and flying abilities and in layer 7 we set the power and toughness to 1/1. Next thing you know, your opponent activates their Alchemist's Refuge to Flash in Grounded on your Inkmoth. Since Grounded and the flying portion of the activated ability both apply in the same layer, they are applied in timestamp order. That is to say, that since Grounded applied more recently (it has the most recent timestamp) its effects take over. Now, were you to activate the ability on the copied Inkmoth Nexus again, then it would overwrite Grounded with the new instance of flying, and your Inkmoth/Metamorph would take to the skies again. Now let's say you control Unstable Shapeshifter and a Birds of Paradise enters the battlefield. Your Shapeshifter becomes a copy of Birds of Paradise, then you cast Gravity Sphere, causing all creatures to lose flying. If you cast Jump on your bird-copy, it will regain flying for the duration of the effect, since the timestamp is newer than that of Gravity Sphere. If, however, you cast a Dungeon Geists, causing your Shapeshifter to become a copy of it, it will not have flying. This is because the flying ability is being granted from the copy effect in Layer 1, where the 'loses flying' effect is being applied in Layer 6. 613.3a Layer 7a: Effects from characteristic-defining abilities that define power and/or toughness are applied. See rule 604.3. 613.3b Layer 7b: Effects that set power and/or toughness to a specific number or value are applied. 613.3c Layer 7c: Effects that modify power and/or toughness (but don't set power and/or toughness to a specific number or value) are applied. 613.3d Layer 7d: Power and/or toughness changes from counters are applied. See rule 121, "Counters." 613.3e Layer 7e: Effects that switch a creature's power and toughness are applied. Such effects take the value of power and apply it to the creature's toughness, and take the value of toughness and apply it to the creature's power. If you control Dungrove Elder and six Forests, your Elder will be a 6/6, applied in Layer 7a. If you cast Giant Growth on your Elder, he gets +3/+3 in Layer 7c, making him a 9/9. 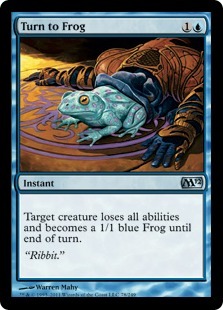 If you then cast Turn to Frog on him, his power and toughness are set to 1/1 in Layer 7b, and he'll be getting +3/+3 from the Giant Growth in Layer 7c, causing him to be a 4/4. Now take the same Dungrove Elder, and say you give him a +1/+1 counter with Travel Preparations which, as above, applies in Layer 7d. You control Castle again, giving him +0/+2 while he's untapped, making him 7/9 while untapped. You cast Twisted Image on it, making it a 9/7. Next, you attack, causing him to lose the +0/+2 from Castle. What are his stats? That's right! He's a 7/7. Even though he's losing two toughness from the Castle, they're being applied in Layer order, rather than Timestamp order, so instead of a 9/5, you end up with a 7/7. So what about your own experiences with Layers? Have these situations come up? What's the most complicated layering-order issue you've had?